I've always loved currency. I don't want to be rich, just different coins and bills interest me. I buy foreign money and coins on ebay for the collection my mom keeps. I'm fortunate enough to live in Canada, our currency is always changing. In 1987 the year I was born the $1 bill was discontinued and the loonie ($1 coin) was put into circulation. In 1996 when I was still a kid in elementary school (when you could buy penny candies at the local convenience store still) my allowance was 2 bucks a week and I still remember the day I got the new Toonie ($2 coin) that replaced the $2 bill. It was so neat and cool, it was the first bi-metal coin I had ever seen and I was quite fascinated by it. In 2001 we got new banknotes with new security features such as watermarks, brail bumps and more holographic foil than the old ones. Recently in 2011 we started to switch to polymer bills, so far we just have the $100 and $50. The plastic bills are odd when you're used to feeling the money to make sure it's the right kind of paper, and they love to stick together when they're new. This year, 2012, is the last year they will be making our penny. I honestly don't see how we can go on calling it a "cent" when there is no longer a 1/100 denomination but it shouldn't effect business that much, I hear it didn't do bad for Australia to get rid of their penny. Also this year, 2012, they changed the toonie and loonie designs slightly, not sure if it's just for this year or permanent, but it looks like a permanent change to me. I love the writing on the side of the toonie. Our other currency is less used for special art than the quarters. We had a 1969 penny featuring a rock dove in flight. We had a 2001 year of the volunteers dime. A victory nickel that came out twice, first to stimulate the war effort (WW2) and the second time to commemorate the 60th anniversary of the end of WW2. A hopping rabbit nickel in 1967. Almost too many loonies to list, but the list can be found here Wikipedia. 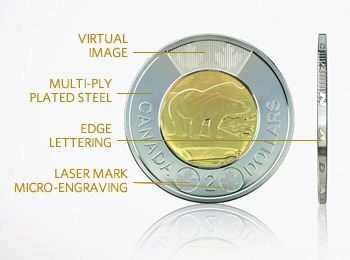 Most commemorative toonies just feature the polar bear in differnt poses or multiple polar bears. In 1999 there was a toonie to commemorate the founding of Nunavut featuring an Inuit drummer. One to commemorate the 400th anniversary of the founding of Quebec City. 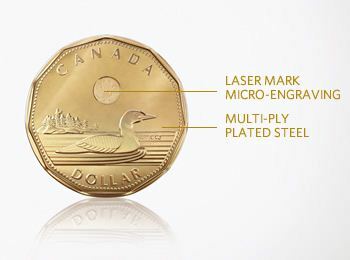 The design of the coin is dominated by a large fleur-de-lis. Other elements include a ship, and lines representing the St. Lawrence River. A boreal forest one in 2011 which celebrates Canada's boreal forest that covers over half of Canada's landmass.